Hello everyone!! I know you guys like pictures so I decided to show you my Prelude. It drove great until I ran into the most annoying problem ever. I feel like my engine is vibrating excessively. When I am at a light, I hear the doors rattling -_-. When my rpm's go up, it goes away. I installed those eBay engine support block that you add to the original ones, only in the front and it felt like it got worse. When I am accelerating and suddenly let go of the gas it like my car bogs or something weird. I mostly feel my car rattling in first gear when I let go of the clutch. My mechanic said it was probably because my rpm's are to low but I change my cap rotor plugs, wires, and still same problem. Any suggestions? I thought I could be my rear engine support but apparently, my mechanic said he is sure it is not that. Looks clean man... I'm diggin' the blue so much! nice car, your rpm at idle should be at 850. if you added ebay engine support blocks?? ?, im guessing you mean motor mount inserts, that will increase the amount your car vibrates. they are used to stiffen up your mounts, so your engine will have as little movement as possible... if your idle is below 850 you need to adjust it on the tb by turning the idle adjustment screw. some people like theirs above 850 to minimize the vibrations, but i keep mine at 850 and have inserts in the front and back. just gotta get used to it. welcome to the board, btw! the idle adj screw is on the tb itself, its not too hard to see if you are looking at the tb. its to the lower left of the tps sensor. 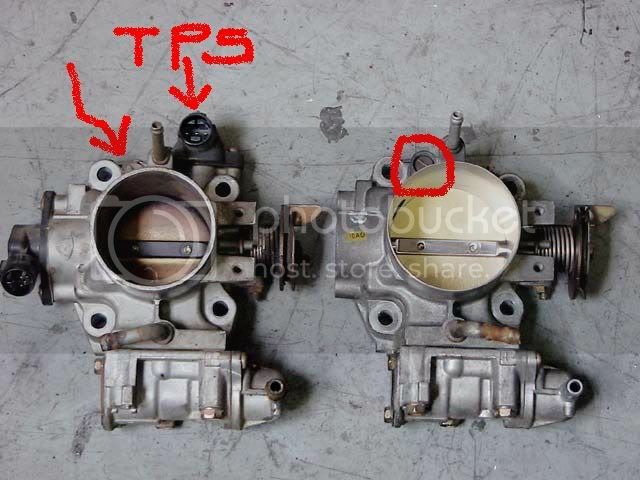 if that doesnt help, look at where your intake meets the throttle body, from the center top of the intake where it meets the tb, take your finger and move it up and left towards the tb. you should see a gold colored screw under a sensor (tps) that sits right on top of the tb. thats the set screw. adj to get 850 on the tach. as far as your car vibrating, it will do that with motor mount inserts. you want it gone? get oem motor mounts. I installed my front and rear myself, i do all my own work, period. id never pay anyone to touch my car. 180 to install the rear insert is crazy. okay this will help you find the set screw...one is a si believe, the other, i dunno, but its in the same location...ok, i circled it in red, then drew in a arrow to show its location with a tb that has a tps sensor...hope that helped. Last edited by hotrod; 02-01-2011 at 08:22 PM. Reason: merging back to back posts. Thank you so much!!! I think I am going to take the inserts out and install new ones. Did you jack your engine up when you did your install? or are the other supports strong enough to hold your engine up? Clean car man, welcome to PZ. yeah, i used a jack, you have to, to get the weight off the mount. the rear is kinda tricky, gotta keep jacking it up, letting it down to get the bolt to go back through. ^^^^^ hahahaha waiting for this..
Wow that car looks great. I sincerely regret the fact that Honda did not offer that color until near the end of its production. If I could have got my 1999, 5th gen Prelude that color, I sure would have done it because its almost the same color as my 1st Prelude as shown in the video below . (1987 Prelude si) Because both the 5th and 2nd gen Prelude have similar sloping hoods and views from the cockpit ,with a little imagination, I could have imagined myself being in a super stock 2nd gen Prelude and it would help with the grief of losing by beloved 2nd gen car that I owned for such a long time. you sir have a very nice car. big fan of the head lights, they look so sleek on 5th gen lude! Welcome to PZ and good luck! im pretty new to the forum but i can relate to the problem you say you having with the engine kinda bogging down when accelerating and letting go of the gas. when i accelerate from a complete stop if i let the gas go anytime its below 2k rpms you can really just feel the whole car pull back almost like if i pressed on the breaks slightly.